Installation view from Catherine Wagner’s exhibition Archaeology in Reverse, 2018. The opening night for Mills’ Nancy Cook Chair of Photography Catherine Wagner’s exhibit, Archæology in Reverse, took place at the Mills College Art Museum on Sept. 8. Wagner, a celebrated and revered artist at Mills, curated a highly anticipated glimpse into the continuing direction of her art by combining photography, site-specific installation and architecture into an exhibit that displays the intricacies of the Mills College Art Museum (MCAM) building. The exhibition is installed in the main viewing area in the museum and contains long periscopes that hang from the ceiling that are used to reveal previously hidden aspects of the architecture, photographs showing what the museum website describes as “the palimpsest of history embedded in various structures of the museum,” a television screen displaying a choreographed dance by Mills’ professor of dance Molissa Fenley in site-specific areas of the museum and exposed windows and openings that are usually closed for exhibitions. These different features of the exhibition have an important purpose. Wagner received the esteemed Rome Prize and was able to work and create in Italy, where she worked with the company modem, an “interdisciplinary practice with experience in software, architecture, urban design, and digital fabrication,” according to their website. 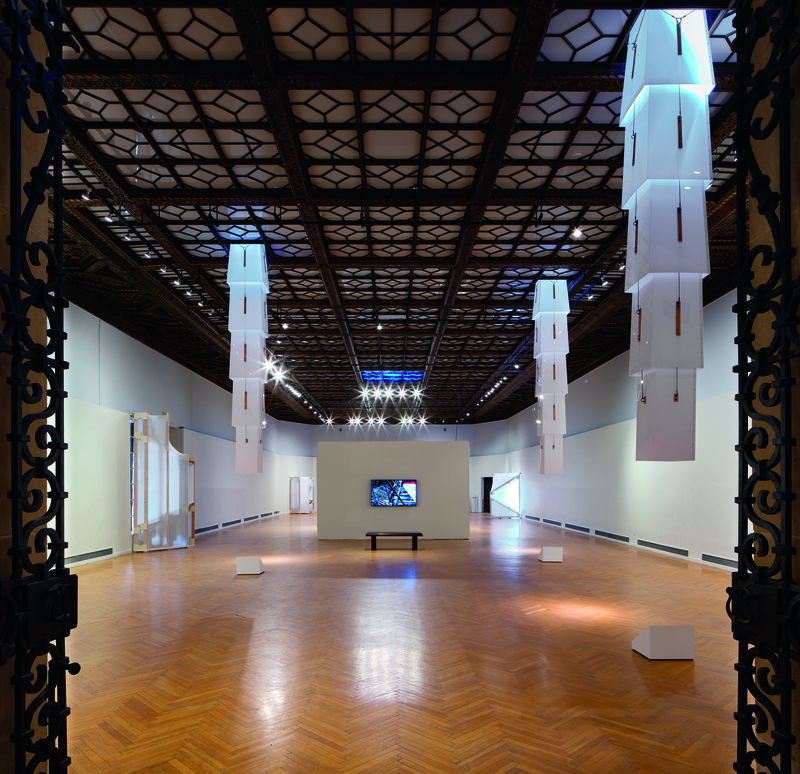 According to program director Jayna Swartzman-Brosky, Wagner wanted to reflect the historically constant state of repair and history preservation in Rome in an installation where viewers could see the architectural history and “bones” of the Mills museum, much like an archaeological site. For example, if a viewer stands in the right spot, slanted mirrors underneath the periscopes reveal the scaffolding and tresses that maintain the building’s structure through tension instead of supporting weight through columns. These are unique in the sense that the museum building is one of the first without columns in California. What’s even more remarkable is the physical manifestation of cameras and photography within this installation. Wagner turned the room into the inside of a camera, with “lenses” (the periscopes) and “apertures” (windows with a fabric called scrim tented around them to frame a view outside) helping show minute details of the building that would not normally be seen by viewers. The aforementioned roof details are marked with colored acrylic plexiglass panels in red, green, and blue — the primary colors for digital printing. The colors of the panels in the apertures and lenses are a call to viewers to look at the hidden elements in the building, according to Swartzman-Brosky. Viewers are able to slowly realize how the exhibition reflects the importance of installation sites themselves. “I like how Catherine Wagner chose to highlight pre-existing structures and show the beauty that was already there,” graduate student Quinn Forrester-Wamsley said. The windows and glass ceiling-roof are usually concealed because without any covering, the areas will allow a lot of light in and potentially degrade the works that are being exhibited. Although aesthetically beautiful, the opportunities to showcase the designs have depended upon the vulnerability of the art presented. Collections and archiving assistant Andrea Ortiz-Galdamez emphasized how much light Wagner has shed upon the hidden scaffolding areas of the building’s architecture, both figuratively and literally. Swartzman-Brosky has commented on the possibility of incorporating parts of Wagner’s exhibition into a permanent fixture of the museum in the future. The catalog of the exhibition, available in the library as well as the museum, contains more information, interviews and essays to better illuminate the viewer of just how detailed this installation is. If you’d like to hear her in her own words, Wagner will be speaking at the Danforth Lecture Hall on Oct. 10 to “revisit 40 years of her work as a photographer,” according to the event information on Facebook.